Like ThreeHundredEight.com on Facebook to be alerted to new CBC articles and updates to the site's provincial and federal polling averages. A total of just four polls on national voting intentions was conducted in the month of June, three of them nationally and one of them in Quebec. In all, these polls surveyed about 7,142 Canadians. They recorded no serious movement in public opinion compared to the month of May. The Liberals averaged 45.9 per cent support, down 2.1 points from last month. The Conservatives followed with 29 per cent, up 0.3 points, while the New Democrats were down 0.9 points to 12.8 per cent. The Greens were up 1.2 points to 5.9 per cent and the Bloc Québécois was up 0.4 points to 4.4 per cent. An average of 2.5 per cent of respondents said they would vote for another party. The Liberals continued to lead in British Columbia, increasing to 44 per cent support. The Conservatives were down 4.5 points to 25.8 per cent, while the New Democrats gained for the third consecutive month to end up at 18 per cent, up from 15.8 per cent three months ago. The Greens were unchanged at 9.7 per cent. In Alberta, the Conservatives were up to 55.9 per cent, followed by the Liberals, who slid to 29.8 per cent, the New Democrats who were at 7.5 per cent, and the Greens who at 3.4 per cent. This movement benefited the Conservatives in the seat projection, as they increased to between 27 and 30 seats. The Liberals fell to between four and seven seats. The Conservatives and Liberals were steady in Saskatchewan and Manitoba with 42.6 and 37.9 per cent support, respectively. 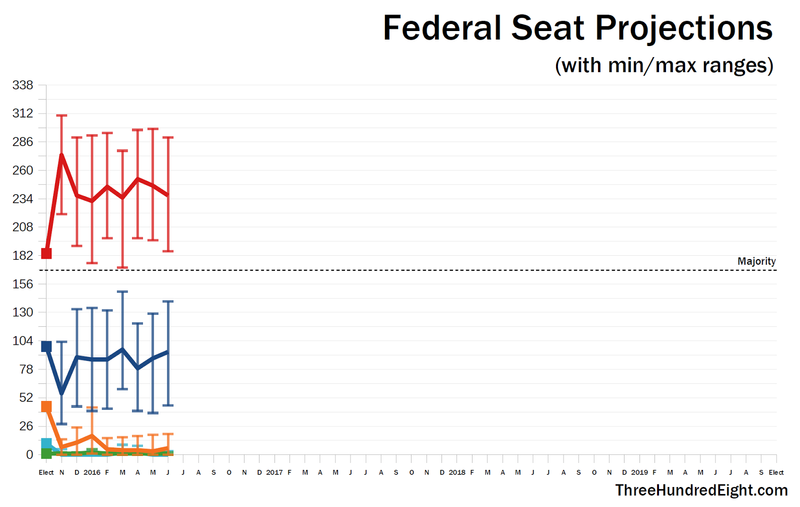 It did result in a swing in the seat projection, though, with the Conservatives up to 18 to 20 seats and the Liberals down to eight to 10 seats. The NDP was down to 12.7 per cent, while the Greens fell for the third consecutive month to 4.9 per cent. The slide was modest, though, as they began this negative trend at 6 per cent. The Liberals dropped 3.5 points in Ontario, but still led with 48.3 per cent support. They dropped to between 83 and 99 seats in the projection. The Conservatives were up to 32.4 per cent (and 21 to 35 seats), while the NDP dropped for the third consecutive month to just 11.4 per cent. The Greens posted their best numbers in the province since July 2015 at 6.4 per cent. In Quebec, the Liberals continued to lead with 50 per cent, down slightly from May but up in the seat projection to between 69 and 73 seats. The Bloc Québécois held on to second spot again last month at 16.1 per cent. The New Democrats, at their lowest level of support since February 2011, fell for the third consecutive month to 15.2 per cent. The Conservatives followed with 12.2 per cent (but were down to between five and eight seats), while the Greens were up to their best since May 2015 at 4.6 per cent. And in Atlantic Canada, the Liberals dropped to 54.5 per cent and between 28 and 29 seats. The Conservatives were up 5.3 points to 23.6 per cent and three seats, while the NDP was down to 13.3 per cent. The Greens posted 6.4 per cent support in the region. With these levels of support, the Liberals would likely have won between 218 and 259 seats in an election held in June. That was down about 16 seats from their standing in May. The Liberals currently hold 183 seats. The Conservatives would have won between 76 and 108 seats, up about 17 seats from last month. They now have 98 seats. The NDP would have picked up about two seats from last month, and would have won between two and 12 seats. That is well below the 44 seats they now have. The Greens would have won between one and two seats (they now have one) and the Bloc between zero and one seat (they now have 10). At the maximum ranges (which largely take into account the potential impact of an election campaign), the Liberals are still well within majority territory. The Conservatives are also the only party vying for Official Opposition status. The NDP, with a maximum of 19 seats, is well above the highs of the Greens (two), and Bloc (three), but all could potentially be shutout, too. 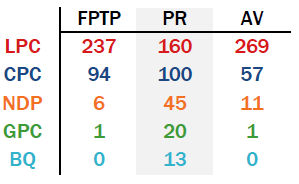 This is based on the current first-past-the-post system (FPTP). With the electoral reform committee now getting to work, it is worthwhile to make some rough estimates of what outcomes different potential systems could produce. These are very basic estimates. For the proportional representation estimate (PR), I have assumed that each province retains the number of seats they currently have. I have rounded up or down the number of seats each party gets in each province, and then gave any leftover seats to the party that finished in first place in the region. For the alternative vote or ranked ballots (AV) I've also done a very simple estimate. Because the Liberals and New Democrats tend to be each other's second choice, I have awarded any seat where either party was projected to be in first place to that party. Any seat that the Conservatives led with 45 per cent or more was awarded to the Tories. Any seat where the Conservative was in first place but with less than 45 per cent was given to either the Liberals or the NDP, depending on which of these parties was in second place. A crude method — but past experience with more sophisticated methods have yielded virtually identical results in the current political landscape. If things change, then it will become worthwhile to make this estimate with greater attention to detail. But a more sophisticated model with current polling numbers would not differ from this cruder one by more than a handful of seats. And, of course, this assumes all else being equal — so no change of behaviour by the parties based on the system in place, no change in the behaviour of voters, and no other parties on the ballot. That is unlikely, but the impact of these things is unknowable at this stage. With those caveats in mind, let's go through the results. 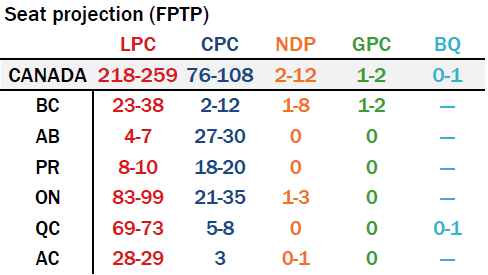 With FPTP, the Liberals win an enormous majority — 237 seats, to 94 for the Conservatives, six for the NDP, and one for the Greens. With 70.1 per cent of the seats, it would be the biggest majority government since Brian Mulroney's Progressive Conservative victory in 1984. With PR, however, the Liberals are kept to a minority with 160 seats, just 10 shy of what they would need for a majority government. The Conservatives win 100 seats, only a little better than they did with FPTP. But the NDP, Greens, and Bloc do significantly better with this system with 45, 20, and 13 seats, respectively. All three of them would reach the threshold of 12 seats needed for official party status. In this scenario, the Liberals could govern with the support of any one of the other opposition parties. The Conservatives, on the other hand, would need the support of all of the other opposition parties to form a government of their own. The Liberals do best under AV, winning 269 seats. At 79.6 per cent of seats on offer, that would be the biggest majority government in Canada's history. 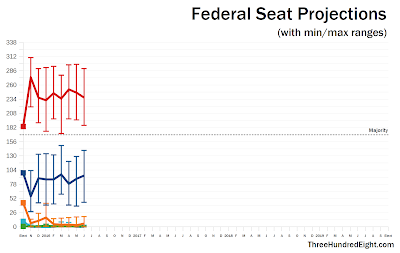 The Conservatives would be reduced significantly to just 57 seats, while the NDP would win 11 seats, a gain of five over FPTP due to a handful of Conservative-NDP races where Liberal second-choice votes would put them over the top. It will be interesting to follow how these numbers will fluctuate until the electoral reform committee finalizes its work and presents a potential alternative to first-past-the-post by the end of the year. In any of these systems, the Liberals do well because they are polling well. It would be a mistake, however, to assume that any advantage they may have today based on which electoral system is adopted would automatically carry through to 2019 and beyond. I wonder if FPTP influences the responses. Strategic voting in 2015 seems to have happened on a large scale to the great disadvantage of the NDP. While LeadNow published riding polls, my feeling is that few voters used them;instead strategic voting happened on a provincial scale. 2. They decided Trudeau was the best bet to overturn Harper. Post election the voters are very happy with their choice and we can expect a prolonged honeymoon. What would the results be under MMPR? Or is that impossible to estimate because of the unknown electoral boundaries? It would require a lot of assumptions on my part. But the results would not be significantly different from those for PR. Have you done a projection based on PR, but with seats assigned province-by-province, based on popular vote percentages in each province instead of nationwide? For example, in Alberta, the Cons would get 56% of the province's federal seats, instead of 29%. Conversely, in Quebec, they would only get 12% of those seats. That is indeed what I did for the PR projection above. Given Elections Canada's timeline for implementing a new electoral system, the transferable vote (maintaining current riding boundaries) seems like the most likely change. Not to mention that the government would probably need to amend or repeal the Fair Elections Act in order to allow Elections Canada to teach people how the new system works. Exactly Ira. Which means Trudeau and Monsef's "consultations" are little more than token events to give a shade of legitimacy to a constitutional reform few people want and even fewer would vote for in a referendum. It's the calculated dishonesty that gets me. Clearly-only one system; Alternative vote or single transferable vote has the operational ability to be in place for the next election. So why are the Liberals holding or rather not holding consultations with Canadians? Let's have a proper discussion debating the merits of AV v. FPTP and voters can make an informed choice through a referendum that almost three quarters of Canadians want in order to change the electoral system. Just to clarify, I do not believe that there is actually any constitutional reform involved in changing the electoral system. "There shall be One Parliament for Canada, consisting of the Queen, an Upper House styled the Senate, and the House of Commons." Nothing at all about an electoral system specifically. If it were a constitutional amendment, a referendum would be required. The electoral system is undoubtedly part of our constitutional system and through common law and precedent is part of our Constitution. You have cherry picked one clause but, I can do the same and get the same result! Surely that constitution similar principle could or would include the electoral system! There is a difference between a Constitutional reform and a constitutional reform. What Trudeau is doing is imposing in an ultra-constitutional manner changes to the unwritten parts of our Constitution. The Canadian Constitution is made up of four parts: The Constitution Acts (including a number of British North America Acts), Constitutional documents such as the Royal Proclamation of 1763, Common Law and Court decisions, constitutional precedents and conventions. Therefore, to only pay attention to the written Constitution is to ignore most of the constitutional canon. Trudeau's "reforms" to the electoral system and the Senate are constitutional amendments but, his Father's Constitution Act, 1982 is so flawed as to be essentially useless, the son must circumvent his father's greatest achievement and pretend it is not constitutional change when clearly it is. Trudeau's "changes" to the Senate may be a violation of S. 42(1) of the Constitution Act as were potentially Harper's. So Trudeau is playing fast and loose with the Constitution and is essentially speaking dishonestly in public about it. Trudeau is only correct if one has an overly narrow understanding or definition of the Canadian Constitution restricting it to the 1867 and 1982 Acts. We know Our Constitution is more diverse than simply two Acts. The Tsilhqot'in decision, the Daniels decision, Trudeau's Government welcomed the Magna Carta to Canada last year and the list goes on! Change is good but, why have rules or a Constitution if we fail to adhere to it when the time comes? If the prime minister is unable to follow the rule of law why should anyone? Trudeau is just giving the next PQ Government ammunition, it is a short sighted attempt at constitutional "reform". Secondly, constitutional amendments are not subject to referenda but the provisions laid out in Ss. 38, 41, 42 43 and 47 of the Constitution Act, 1982. There is a strong argument to be made that following the 1993 Charlottetown referenda a new convention exists whereby future constitutional amendments should be subject to plebiscite. Thus far however, if such a convention exists it has not been tested. I would disagree, Winnipeg. Our constitution is just those two acts. The decisions you refer to are merely interpretations of those acts. Those acts, however, are riddled with interpretive clauses (which is lousy legislative design), so their precise meaning is often ambiguous. Hence the need to court decisions. No Ira it is not. Why you would think that way is beyond me? This is usually explained in a first year class and any half decent book on the Canadian Constitution will outline within the first few pages the components of the Constitution: Constitution Acts, UK and Canadian statutes, Common law decisions on the executive, judiciary and Legislature, constitutional convention and precedent. Indeed, the Constitution Acts make this clear in S. 53 of the 1982 Act lists some 30 UK and Canadian statutes and Orders-in-Council that became codified parts of the Constitution with this Act! As for constitutional conventions this should be obvious and incontrovertible; The confidence convention is mentioned not once in the two Constitution Acts you mention Ira but, undoubtedly it is part of our constitution. As is the appointment process -the constitutional convention the Crown appoints the leader of the largest party in the House of Commons to form Government. No factual evidence exists to support your contention I am afraid Ira-you are simply incorrect. As Eric's analysis shows Alternative Vote is a terrible system. Who wants a system that leaves the Green Party with as many seats as it has now and excludes the Bloc? How is such a system more egalitarian or just than the current system? How is it more proportional? The Liberals are trying to pull a fast one on Canadians for their own machiavellian purposes-it is going to lead to a heap of trouble unless put to a referendum or proper constitutional negotiations. The problem with PR using regions is that since each region has a different number of seats, then the cutoff to achieve a seat is different for each region. For example to get a seat in the prairies, a party needs to get 3.6% for a full seat (or 1.8% if rounding up is allowed) while in Ontario the cutoff is a ridiculous 0.83% (0.42% if rounding up is allowed). Pawel: The larger provinces would surely be divided into several electoral districts in a PR system. For example, Ontario could have 11 districts of 11 members each, Quebec could be divided into 6 district of 13 members each, BC could be two districts of 14 members each, etc. what the problem is with a party receiving 1% of the vote in Ontario getting a seat in Parliament. The people that vote for the small parties deserve as much to be represented as other people. BC could be divided into two district of 14 members but, losing a third of our M.P.s may not go over well with the population. No province is going to want to lose members after the whole fight of getting more MPs to represent the provinces in the first place. I agree that 1% could be a possibility, but the argument of fairness becomes why its a bigger hurdle in one province then another. I had expected the NDP to somewhat recover in the polls by now but, 13% and the potential of 2-12 seats surely must be the doldrums. There is almost no enthusiasm for the leadership race with only an unofficial candidate and nobody is predicting John Horgan will become the next premier of BC. I am beginning to ask myself if the NDP will compete in subsequent general elections? Maybe they shouldn't? What the NDP should be doing is organising workers into unions: fast food employees being an obvious "target". Why the Party fails to have a social(ism) outreach component is beyond me? Those in the NDP always talk of the good unions have done-but- then they don't act on strengthening or expanding the unions-which really must be done in conjunction with legislation in order for employees who sign up not be fired. Although the next election is years away they're running out of time to demonstrate their utility. If the NDP of today is not willing or able to fight for the workers of today then they have an existential problem which probably leads to the conclusion the NDP is past its best before date-no longer able to perform a meaningful role in or for society. That's possible, Pete -- after the NDP's near-extinction in 1993 its future in federal politics was in question. It may experience another existential crisis in 2019 - although much can change by then. Unionizing fast food is hard work with little reward. Each restaurant tends to have only a few dozen employees -- a paid organizer does a lot of work for little resulting union dues. Fast foods have high staff turnover, so by the 3rd or 4th month of signing up union members you are already losing some and momentum drops. Fast food franchises have deep pockets to spend on fighting unionization attempts. And even if you are successful, it's not that costly to the owner to close a fast food and set up somewhere else -- even where that is illegal, it's very hard to enforce. I understand the difficulties especially the owners' ability to fight unionisation attempts that is why I made of point of writing that such efforts should be done in conjunction with legislation. As for the high turnover, I think that would change with higher wages and benefits. There is not a high turnover among the employees at Safeway or Sobey's who in many ways hold similar unskilled jobs-the difference-you can earn a living wage and receive healthcare benefits for your family. Undoubtedly it is difficult and a process that will take years but, the NDP is not winning Government any time soon so they have the time if nothing else. Everybody's constantly pronouncing the doom of the NDP; even when they were Official Opposition everyone's line was always "oh, they're just a flash-in-the-pan and it's not for real". There is such an ingrained societal expectation of failure, egged on by the media, that voters just cannot bring themselves to believe that anyone other than the Liberals and Conservatives can ever win (and the two right-wing parties love to propagate that idea for their own benefit).